This article is about the American football season in the United States. For the Gaelic football season in Ireland, see 2013 National Football League (Ireland). Eight players were assigned the non-exclusive franchise tag by their teams, which ensured that the team would receive compensation were the player to sign a contract with another team. These players were Brandon Albert ( Chiefs), Jairus Byrd ( Bills), Ryan Clady ( Broncos), Michael Johnson ( Bengals), Pat McAfee ( Colts), Henry Melton ( Bears), Anthony Spencer ( Cowboys) and Randy Starks ( Dolphins). None of these players changed teams. There were two NFL International Series games held at Wembley Stadium in London. On September 29, the Minnesota Vikings defeated the Pittsburgh Steelers 34–27. On October 27, the San Francisco 49ers season defeated the Jacksonville Jaguars 42–10. This season was the first of a four-year agreement for the Jaguars to play a home game in London (an agreement which was later extended an additional four years). Week 14: The Panthers– Saints game, originally scheduled at 1:00 p.m. ET on Fox, was flexed into the 8:30 p.m. ET time slot on NBC. The original Sunday night contest, the Falcons–Packers game, was then changed to 1:00 p.m. ET on Fox. It was the second time the Packers were stripped of a prime-time appearance this season. ^ Cincinnati defeated Indianapolis head-to-head ( Week 14, 42–28). ^ Pittsburgh defeated the New York Jets head-to-head ( Week 6, 19–6). ^ Baltimore defeated the New York Jets head-to-head ( Week 12, 19–3). ^ Oakland defeated Jacksonville head-to-head ( Week 2, 19–9). ^ Jacksonville defeated Cleveland head-to-head ( Week 13, 32–28). ^ Chicago defeated Dallas head-to-head ( Week 14, 45–28). ^ The New York Giants defeated Detroit head-to-head ( Week 16, 23–20 (OT)). The wild card round of the playoffs featured the two wild card playoff qualifiers from each conference being hosted by the two lowest seeded divisional winners. The top two seeds in each conference — the Seahawks, Panthers, Broncos and Patriots — all had first-round byes. The games were played January 4–5, 2014. The conference championships took place on Sunday, January 19, 2014. "Peel-back" blocks will now result in 15-yard personal foul penalties anywhere on the field. Previously, these type of blocks were permitted within the tackle box. Dean Blandino was named as the league's new Vice President of Officiating, succeeding Carl Johnson. Referee Alberto Riveron was then promoted to the league's Senior Director of Officiating, a newly created position as a second-in-command under Blandino. Bill Vinovich, who worked the previous season as a substitute referee, was then assigned to head Riveron's former on-field officiating crew. For a more comprehensive list, see List of 2013 NFL records and milestones. Cleveland Browns Pat Shurmur  Rob Chudzinski  Shurmur compiled a record of 9–23 (.281) and failed to make the playoffs in two seasons as coach of the Browns. In the six games (seven weeks) that Kromer served as interim head coach, the Saints compiled a record of 2–4 (.333);  in the ten games under Vitt, the team went 5–5 (.500). Del Rio, the Broncos' defensive coordinator, had previously been the Jacksonville Jaguars' head coach from 2003 through 2011. The Broncos went 3–1 under Del Rio. Kubiak was fired on December 6, after a loss to the Jaguars on Thursday Night Football which was a franchise record eleventh straight defeat. Kubiak leaves Houston with a record of 63–66 (.488), including the franchise's only two playoff appearances. a – Played one home game in Toronto, Ontario, Canada. b – Played one home game in London, England. 2013 marked the final season in which the Minnesota Vikings played their home games at the Hubert H. Humphrey Metrodome, as the team will move temporarily to TCF Bank Stadium (home of the University of Minnesota Golden Gophers) while their U.S. Bank Stadium is built at the same site as the Metrodome. The Vikings will play the 2014 and 2015 seasons at TCF Bank Stadium and open their new stadium for the 2016 season. The Vikings had called the Metrodome home since it opened in 1982. ^ a b "2013 National Football League important dates" (PDF). National Football League. February 5, 2013. Archived (PDF) from the original on April 4, 2014. Retrieved April 4, 2014. ^ a b "Free agency signing period begins; 524 players become free agents" (PDF). National Football League. Archived (PDF) from the original on March 20, 2013. Retrieved April 4, 2014. ^ "2013 NFL Free Agency Questions & Answers". National Football League. Archived from the original on February 13, 2014. Retrieved April 7, 2014. ^ Farrar, Doug (March 9, 2013). "What you need to know about legal free-agent tampering". Shutdown Corner (blog). Yahoo! Sports. Archived from the original on April 21, 2014. Retrieved April 21, 2014. ^ "NFL free agency tracker: Player moves and analysis". Sporting News. March 19, 2013. Archived from the original on July 29, 2013. Retrieved April 8, 2014. ^ a b Rosenthal, Gregg (February 27, 2013). "San Francisco 49ers agree to trade Alex Smith to Chiefs". Around the League (blog). NFL.com. Archived from the original on February 23, 2014. Retrieved April 16, 2014. ^ Connor, Matt (October 28, 2013). "Alex Smith trade compensation changes to 2014 2nd round pick". Arrowhead Pride (blog). Archived from the original on April 16, 2014. Retrieved April 16, 2014. ^ Campbell, Dave (March 12, 2013). "Vikings finalize Harvin trade, release Winfield". The Seattle Times. Associated Press. Archived from the original on April 16, 2014. Retrieved April 16, 2014. ^ Banks, Don (March 11, 2013). "With Harvin trade, fortune likely to favor bold Seahawks again". Sports Illustrated. Archived from the original on March 19, 2014. Retrieved April 16, 2014. ^ Florio, Mike (March 12, 2013). "Harvin gets $67 million over six years". Pro Football Talk. Archived from the original on March 19, 2014. Retrieved April 16, 2014. ^ Vensel, Matt (March 12, 2013). "A few thoughts on yesterday's Anquan Boldin trade". The Baltimore Sun. Archived from the original on August 22, 2013. Retrieved April 16, 2014. ^ a b Mehta, Manish (April 22, 2013). "Jets and Tampa Bay Buccaneers agree on Darrelle Revis trade". Daily News (New York). Archived from the original on May 13, 2013. Retrieved April 16, 2014. ^ Perez, A. J. (March 12, 2014). "NFL free agency 2014: Darrelle Revis agrees to deal with New England Patriots, report says". NJ.com. The Star-Ledger. Archived from the original on April 16, 2014. Retrieved April 16, 2014. ^ Hensley, Jamison (October 3, 2013). "Eugene Monroe officially a Raven". ESPN. Archived from the original on March 20, 2014. Retrieved April 16, 2014. ^ Teicher, Adam (April 25, 2013). "KC selects offensive lineman Eric Fisher with No. 1 overall pick". The Kansas City Star. Archived from the original on August 14, 2013. Retrieved April 7, 2014. ^ Hanzus, Dan (July 1, 2013). "NFL training camp schedule with dates and locations". Around the League (blog). NFL.com. Archived from the original on March 21, 2014. Retrieved April 22, 2014. ^ "Cowboys hold off Dolphins in Hall of Fame game". USA Today. Associated Press. August 5, 2013. Archived from the original on October 10, 2013. Retrieved October 10, 2013. ^ "Hall of Fame Duel: Cowboys vs. Dolphins". Pro Football Hall of Fame. March 9, 2013. Archived from the original on October 10, 2013. Retrieved October 10, 2013. ^ "NFL Network's Preseason Schedule Concludes with Live Double-Header on Thursday, August 29". National Football League. Archived from the original on February 13, 2014. Retrieved April 21, 2014. ^ "2013 NFL Schedule Announced" (PDF). National Football League. April 18, 2013. Archived (PDF) from the original on March 25, 2014. Retrieved April 18, 2014. ^ Zimmer, John; Marini, Matt, eds. (2013). Official 2013 National Football League Record & Fact Book (PDF). New York: National Football League. ISBN 978-1-603-20980-9. Archived from the original (PDF) on October 11, 2013. Retrieved October 11, 2013. ^ a b "2013 NFL Schedule Announced" (PDF). National Football League. Archived (PDF) from the original on March 25, 2014. Retrieved March 25, 2014. ^ Wesseling, Chris (March 22, 2013). "Baltimore Ravens will open 2013 season on road". Around the League (blog). NFL.com. Archived from the original on March 25, 2014. Retrieved March 22, 2013. ^ Zrebiec, Jeff (April 18, 2013). "Ravens' 2013 schedule starts in Denver, includes home Thanksgiving game against Pittsburgh". The Baltimore Sun. Archived from the original on February 19, 2014. Retrieved April 21, 2014. ^ "Peyton: First with 7 TDs since '69". ESPN. September 6, 2013. Archived from the original on March 26, 2014. Retrieved March 26, 2014. ^ LoGiurato, Brett (September 30, 2013). "Raiders vs. Chargers to be moved to 11:35 p.m. on Sunday due to baseball playoffs". SI.com. Archived from the original on March 25, 2014. Retrieved September 30, 2013. ^ Wilkening, Mike (September 30, 2013). "Chargers-Raiders to kick off at 11:35 p.m. Eastern on Sunday night". Pro Football Talk. NBC Sports. Archived from the original on March 25, 2014. Retrieved September 30, 2013. ^ "Raiders stifle Chargers in late-night NFL showdown". USA Today. Associated Press. October 7, 2013. Archived from the original on April 22, 2014. Retrieved April 22, 2014. ^ Mitchell, Bob (January 29, 2013). "Buffalo Bills, Rogers Centre reach deal to continue playing one NFL game per season in Toronto". Toronto Star. Archived from the original on March 25, 2014. Retrieved March 25, 2014. ^ Breer, Albert (May 22, 2012). "Five-year extension of Buffalo Bills' Toronto series approved". NFL.com. Archived from the original on March 25, 2014. Retrieved December 12, 2012. ^ Gutierrez, Paul (September 30, 2013). "Raiders to have late kickoff Sunday". ESPN. Archived from the original on March 25, 2014. Retrieved September 30, 2013. ^ Smith, Michael David (October 3, 2013). "NFL moves Week Seven Texans-Chiefs kickoff to 4:25 Eastern". Pro Football Talk. NBC Sports. Archived from the original on March 25, 2014. Retrieved October 3, 2013. ^ "October 20 Texans-Chiefs Game Moves to 4:25 PM ET on CBS" (PDF). NFL Communications. National Football League. October 3, 2013. Archived (PDF) from the original on March 25, 2014. Retrieved October 3, 2013. ^ Sessler, Marc (November 1, 2013). "NFL flexes Week 11 Chiefs-Broncos tilt into 'SNF' slot". NFL.com. Archived from the original on March 25, 2014. Retrieved November 2, 2013. ^ Brinson, Will (December 10, 2013). "Bears-Eagles flexed to Sunday night over Pats-Ravens in Week 16". CBS Sports. Archived from the original on March 25, 2014. Retrieved December 10, 2013. ^ a b "2013 Conference Standings". NFL.com. Retrieved December 8, 2013. ^ a b "2013 NFL playoff picture". CBS Sports. Retrieved December 8, 2013. ^ "Andrew Luck, Colts shock Chiefs with 2nd-largest playoff comeback". ESPN. January 4, 2014. Archived from the original on March 17, 2014. Retrieved April 2, 2014. ^ a b c "Elias Says...Colts beat Chiefs in one for the ages... and the record books". ESPN. Elias Sports Bureau. January 5, 2014. Archived from the original on January 6, 2014. Retrieved January 19, 2014. ^ "All Games in Pro Football History with a 45 to 44 score". Pro-Football-Reference.com. Archived from the original on January 19, 2014. Retrieved January 19, 2014. ^ "Chiefs break NFL record for consecutive playoff defeats". Red Zone (blog). The Kansas City Star. January 4, 2014. Archived from the original on April 2, 2014. Retrieved April 2, 2014. ^ Holder, Larry (January 5, 2014). "Shayne Graham boots New Orleans Saints past Philadelphia Eagles in NFC wild-card matchup". The Times-Picayune. Archived from the original on January 6, 2014. Retrieved April 24, 2014. ^ "Surging Chargers oust Bengals, set up rematch with Broncos". ESPN. Associated Press. January 5, 2014. Archived from the original on April 19, 2014. Retrieved April 24, 2014. ^ "Phil Dawson's kick lifts 49ers past Packers in frigid wild-card game". ESPN. Associated Press. January 5, 2014. Archived from the original on April 20, 2014. Retrieved April 24, 2014. ^ "NFL final eight take center stage in divisional playoffs" (PDF). National Football League. January 7, 2014. Archived (PDF) from the original on April 24, 2014. Retrieved April 24, 2014. ^ Condotta, Bob (January 11, 2014). "Seahawks hold on, beat Saints 23-15". The Seattle Times. Archived from the original on March 30, 2014. Retrieved April 24, 2014. ^ a b Manza Young, Shalise (January 11, 2014). "LeGarrette Blount carries Patriots over Colts, 43–22". The Boston Globe. Archived from the original on April 25, 2014. Retrieved April 25, 2014. ^ "Elias Says...Brady sets QB record with 25 postseason start". ESPN. Elias Sports Bureau. January 12, 2014. Archived from the original on January 14, 2014. Retrieved January 19, 2014. ^ Van Bibber, Ryan (January 12, 2014). "Bill Belichick closes in on postseason wins record". SB Nation. Archived from the original on January 30, 2014. Retrieved April 2, 2014. ^ a b "What to Look For – A Look Back (Division weekend)" (PDF). National Football League. January 13, 2014. Archived (PDF) from the original on April 2, 2014. Retrieved April 2, 2014. ^ "Colin Kaepernick leads Niners past Panthers, back into NFC title game". ESPN. Associated Press& Elias Sports Bureau. January 12, 2014. Archived from the original on March 27, 2014. Retrieved January 19, 2014. ^ Williams, Eric D. (January 12, 2014). "Bolts show grit, promise in loss to Broncos". San Diego Chargers NFL Nation blog. ESPN. Archived from the original on April 5, 2014. Retrieved April 25, 2014. ^ "Manning, Broncos top Chargers, make AFC title game". Sports Illustrated. Associated Press. January 12, 2014. Archived from the original on April 25, 2014. Retrieved April 25, 2014. ^ Klis, Mike (January 12, 2014). "Peyton Manning, Broncos get past Chargers; set up AFC title game vs. Patriots". The Denver Post. Archived from the original on January 22, 2014. Retrieved April 25, 2014. ^ Davis, Nate (January 14, 2014). "AFC championship story lines: Peyton-Brady XV should differ from Peyton-Brady XIV". USA Today. Archived from the original on April 28, 2014. Retrieved April 28, 2014. ^ "Peyton Manning, Broncos rip Patriots to reach Super Bowl". ESPN. Associated Press. January 19, 2014. Archived from the original on April 26, 2014. Retrieved April 28, 2014. ^ "Peyton Manning, Broncos rip Patriots to reach Super Bowl". ESPN. March 31, 2014. Archived from the original on March 31, 2014. Retrieved April 2, 2014. ^ "What To Look For – A Look Back" (PDF). National Football League. January 20, 2014. Archived (PDF) from the original on February 21, 2014. Retrieved February 3, 2014. ^ "Seahawks hold off 49ers' late rally, advance to Super Bowl". ESPN. Associated Press. January 19, 2014. Archived from the original on April 27, 2014. Retrieved April 29, 2014. ^ Eagle, Ben. "Richard Sherman calls out Michael Crabtree in all-time postgame interview". Sports Illustrated. Audibles (blog). Archived from the original on February 20, 2014. Retrieved January 20, 2014. ^ "Top stats to know: Super Bowl matchup". ESPN. January 19, 2014. Archived from the original on March 28, 2014. Retrieved April 29, 2014. ^ a b c d "2013 Kickoff Guide" (PDF). National Football League. Archived (PDF) from the original on April 7, 2014. Retrieved April 7, 2014. ^ a b c "Flying high: Seahawks dominate Broncos in SB XLVIII rout". ESPN. Associated Press. February 2, 2014. Archived from the original on April 28, 2014. Retrieved April 29, 2014. ^ a b c "Records set/tied in Super Bowl XLVIII". Fox Sports. February 2, 2014. Archived from the original on February 3, 2014. Retrieved April 17, 2014. ^ "NFL Career Playoffs Passing Yards Leaders". Pro-football-reference.com. Archived from the original on January 19, 2014. Retrieved April 2, 2014. ^ Nguyen, Joe (January 28, 2013). "Peyton Manning in striking distance of playoff passing yards record". First-and-Orange (blog). The Denver Post. Archived from the original on January 30, 2014. Retrieved April 2, 2014. ^ "Flying high: Seahawks dominate Broncos in SB XLVIII rout". ESPN. Associated Press. February 2, 2014. Archived from the original on March 30, 2014. Retrieved April 2, 2014. ^ Garcia, Oscar (January 28, 2013). "Players defend Pro Bowl after 62-35 NFC win". Yahoo! News. Associated Press. Archived from the original on March 25, 2014. Retrieved March 25, 2014. ^ a b Rosenthal, Gregg (March 21, 2013). "Roger Goodell: Pro Bowl will continue in Hawaii in 2014". NFL.com. Archived from the original on March 25, 2014. Retrieved May 1, 2013. ^ "As American as Mom, Apple Pie and Football?" (PDF). Harris Interactive. January 16, 2014. Archived from the original (PDF) on January 16, 2014. Retrieved April 18, 2014. ^ Stock, Kyle (July 1, 2013). "Patriots' Jersey Swap for Hernandez Fans Sets a Pricey Precedent". Bloomberg Businessweek. Archived from the original on January 22, 2014. Retrieved April 16, 2014. ^ Belson, Ken; Mather, Victor (April 15, 2015). "Aaron Hernandez Found Guilty of First-Degree Murder". The New York Times. Retrieved September 9, 2015. ^ Schapiro, Rich (February 22, 2014). "Eagles' Riley Cooper caught hell for yelling N-word at Kenny Chesney concert". Daily News (New York). Archived from the original on April 9, 2014. Retrieved April 9, 2014. ^ Breslow, Jason M. (August 29, 2013). "NFL Reaches $765 Million Settlement In Concussion Lawsuit". Frontline. PBS. Archived from the original on January 29, 2014. Retrieved April 8, 2014. ^ "NFL, retired players resolve concussion litigation; Court-appointed mediator hails "historic" agreement" (PDF). Alternative Dispute Resolution Center. Irell & Manella. Archived (PDF) from the original on September 3, 2013. Retrieved April 8, 2014. ^ Breslow, Jason M. (January 14, 2014). "Judge Rejects $765 Million NFL Concussion Settlement". Frontline. PBS. Archived from the original on January 16, 2014. Retrieved April 8, 2014. ^ Stroud, Rick (October 3, 2013). "Bucs have released QB Josh Freeman". Tampa Bay Times. Archived from the original on October 7, 2013. Retrieved April 16, 2014. ^ Burke, Chris (October 7, 2013). "Josh Freeman signs with Minnesota Vikings". Sports Illustrated. Audibles (blog). Archived from the original on November 27, 2013. Retrieved April 16, 2014. ^ Tomasson, Chris (April 16, 2014). "Josh Freeman to join Giants after disastrous Vikings tenure". Vikings Now (blog). St. Paul Pioneer Press. Archived from the original on April 16, 2014. Retrieved April 16, 2014. ^ Yasinskas, Pat (October 12, 2013). "Third Buc tests positive for MRSA". ESPN. Archived from the original on March 30, 2014. Retrieved April 17, 2014. ^ Pells, Eddie (October 27, 2013). "Outbreak of MRSA in Tampa Bay brings disease back to the forefront in NFL". The Advocate. Associated Press. Archived from the original on April 17, 2014. Retrieved April 17, 2014. ^ Wilson, Ryan (October 12, 2013). "Eagles-Buccaneers game a go despite latest MRSA outbreak". Eye on Football (blog). CBS Sports. Archived from the original on October 13, 2013. Retrieved April 17, 2014. ^ "Visiting locker room in Atlanta cleaned for MRSA after Bucs leave". Fox 13 Tampa Bay. October 20, 2013. Archived from the original on December 4, 2013. Retrieved April 17, 2014. ^ Pennington, Bill (November 8, 2013). "Prized for His Aggression, Incognito Struggled to Stay in Bounds". The New York Times. Archived from the original on April 8, 2014. Retrieved April 8, 2014. ^ a b Shpigel, Ben (February 14, 2014). "'A Classic Case of Bullying' on the Dolphins, Report Finds". The New York Times. Archived from the original on March 5, 2014. Retrieved April 8, 2014. ^ Hanzus, Dan (February 19, 2014). "Jim Turner fired by Miami Dolphins after Wells report". Around the League (blog). NFL.com. Archived from the original on March 3, 2014. Retrieved April 14, 2014. ^ Maske, Mark; Jones, Mike (December 11, 2013). "Robert Griffin III shut down for rest of season; Washington Redskins will start Kirk Cousins on Sunday". The Washington Post. Archived from the original on April 16, 2014. Retrieved April 16, 2014. ^ Maske, Mark; Jones, Mike (December 30, 2013). "Redskins fire Mike Shanahan after 3-13 year; GM Bruce Allen to lead search for replacement". The Washington Post. Archived from the original on April 16, 2014. Retrieved April 16, 2014. 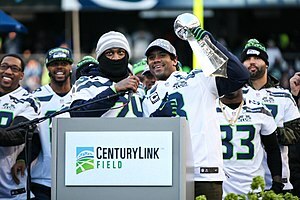 ^ "Russell Wilson tops NFLPI Top 50 Player Sales List". National Football League Players Association. April 28, 2014. Archived from the original on May 8, 2014. Retrieved May 8, 2014. ^ Thursby, Keith (June 3, 2013). "David 'Deacon' Jones dies at 74; Fearsome L.A. Rams lineman". Los Angeles Times. Archived from the original on April 9, 2014. Retrieved April 9, 2014. ^ "NFL Creates "Deacon Jones Award"". National Football League. June 24, 2013. Archived from the original on February 13, 2014. Retrieved April 9, 2014. ^ "Robert Mathis Wins Inaugural Deacon Jones Award". National Football League. January 2, 2014. Archived from the original on February 23, 2014. Retrieved April 9, 2014. ^ Barron, David (October 21, 2013). "Titans owner Bud Adams dies at 90". Houston Chronicle. Archived from the original on November 10, 2013. Retrieved April 10, 2014. ^ Climer, David (October 22, 2013). "With Bud Adams' death, what lies ahead for Titans?". USA Today. Archived from the original on April 10, 2014. Retrieved April 10, 2014. ^ "Titans' Succession Plan Keeps Team In Bud Adams' Family". Sports Business Daily. October 30, 2013. Archived from the original on April 10, 2014. Retrieved April 10, 2014. ^ "2013 Pro Football Deaths". Pro Football Necrology List. Oldest Living Pro Football Players. Archived from the original on April 10, 2014. Retrieved April 10, 2014. ^ "Rules Changes proposed for 2013 NFL Season". The Pewter Plank (blog). FanSided.com. March 15, 2013. Archived from the original on March 26, 2014. Retrieved March 15, 2013. ^ a b c d e f g "2013 Official Playing Rules of the National Football League" (PDF). National Football League. 2013. p. 3. Archived (PDF) from the original on March 26, 2014. Retrieved March 26, 2014. ^ "Competition Committee Press Conference with St. Louis Rams Head Coach Jeff Fisher, NFL Vice President of Officiating Dean Blandino and NFL Senior Director of Officiating Alberto Riveron (transcript)" (PDF). National Football League. Archived (PDF) from the original on March 26, 2014. Retrieved March 26, 2013. ^ a b Smith, Michael David (September 17, 2013). "NFL safety committees told teams not to wear throwback helmets". Pro Football Talk. Archived from the original on March 26, 2014. Retrieved September 19, 2013. ^ a b Breech, John (September 17, 2013). "Buccaneers scrap plans to wear Creamsicle throwback uniforms". CBS Sports. Archived from the original on March 26, 2014. Retrieved September 19, 2013. ^ "Dean Blandino named NFL vice president of officiating". NFL.com (Press release). February 7, 2013. Retrieved February 28, 2019. ^ "Alberto Riveron is officiating director". Associated Press. ESPN. February 19, 2012. Retrieved February 20, 2012. ^ Best, Neil (December 14, 2011). "NFL renews lucrative TV deals". Newsday. Archived from the original on March 25, 2014. Retrieved December 12, 2012. ^ a b c d e f "Record Breaking 2013 Season Had It All" (PDF). NFL. December 30, 2013. Archived (PDF) from the original on March 28, 2014. Retrieved February 3, 2014. ^ Wesseling, Chris (December 22, 2013). "Peyton Manning breaks NFL record with 51st touchdown pass". NFL.com. National Football League. Archived from the original on December 24, 2013. Retrieved December 22, 2013. ^ "Seven from Sunday — Week 16" (PDF). National Football League. December 22, 2013. Archived (PDF) from the original on December 24, 2013. Retrieved February 2, 2014. ^ a b "2013 NFL Standings, Team & Offensive Statistics". Pro-Football-Reference.com. Archived from the original on March 22, 2014. Retrieved April 10, 2014. ^ Miklasz, Bernie (December 30, 2013). "Hekker sets NFL punting record". St. Louis Post-Dispatch. Archived from the original on March 28, 2014. Retrieved February 25, 2014. ^ a b c Rosenthal, Gregg (December 31, 2012). "Cardinals fire Ken Whisenhunt, GM Rod Graves". Around the League (blog). NFL.com. Archived from the original on October 22, 2013. Retrieved December 31, 2012. ^ a b Baum, Bob (January 17, 2013). "Cardinals hire Bruce Arians as head coach". Yahoo! Sports. Associated Press. Archived from the original on March 8, 2013. Retrieved January 17, 2013. ^ Somers, Kent (January 1, 2013). "Arizona Cardinals fire head coach Ken Whisenhunt, general manager Rod Graves". The Arizona Republic. Archived from the original on April 9, 2014. Retrieved April 9, 2014. ^ Somers, Kent (December 31, 2012). "Arizona Cardinals suffer worst loss in franchise history against Seattle Seahawks". The Arizona Republic. Archived from the original on April 3, 2014. Retrieved December 9, 2012. ^ a b Maiorana, Sal (December 31, 2012). "Bills fire coach Chan Gailey". USA Today. Archived from the original on April 4, 2014. Retrieved December 31, 2012. ^ a b Copeland, Kareem (January 6, 2013). "Doug Marrone named next Buffalo Bills head coach". Around the League (blog). NFL.com. Archived from the original on November 11, 2013. Retrieved April 4, 2014. ^ Graham, Tim (January 6, 2014). One year later, Chan Gailey says he's almost certainly retired. The Buffalo News. Retrieved January 12, 2015. ^ Samuel, Ebenezer (December 31, 2012). "Andy Reid, Lovie Smith, Norv Turner and Romeo Crennel among NFL coaches fired on Black Monday". Daily News (New York). Archived from the original on December 26, 2013. Retrieved December 31, 2012. ^ a b Wright, Michael C. (January 16, 2013). "Bears hire Alouettes' Marc Trestman". ESPNChicago.com. ESPN. Archived from the original on November 14, 2013. Retrieved January 17, 2013. ^ "Vote: Who is to blame for Bears' collapse?". ESPNChicago.com. ESPN. December 31, 2012. Archived from the original on November 10, 2013. Retrieved December 31, 2012. ^ a b c Davis, Nate (December 31, 2012). "Browns fire coach Pat Shurmur, GM Tom Heckert". USA Today. Archived from the original on April 4, 2014. Retrieved December 31, 2012. ^ a b Cabot, Mary Kay (January 10, 2013). "Cleveland Browns hire Rob Chudzinski as head coach". The Plain Dealer. Archived from the original on November 10, 2013. Retrieved April 4, 2014. ^ a b Katzowitz, Josh (January 10, 2013). "Jaguars fire coach Mike Mularkey". Eye on Football (blog). CBS Sports. Archived from the original on November 11, 2013. Retrieved January 10, 2013. ^ a b O'Halloran, Ryan (January 18, 2013). "Jaguars' coaching search ends with Gus Bradley". Jacksonville.com. The Florida Times-Union. Archived from the original on April 4, 2014. Retrieved April 4, 2014. ^ a b "Chiefs fire Romeo Crennel". ESPN. Associated Press. December 31, 2012. Archived from the original on December 6, 2013. Retrieved April 4, 2014. ^ a b Mortensen, Chris; Schefter, Adam (January 4, 2013). "Andy Reid is new Chiefs coach". ESPN. Archived from the original on November 14, 2013. Retrieved April 4, 2013. ^ a b Garafolo, Mike (December 31, 2012). "Eagles fire Andy Reid after 14 seasons". USA Today. Archived from the original on April 4, 2014. Retrieved April 4, 2014. ^ a b "Eagles hire Chip Kelly as coach". ESPN. January 16, 2013. Archived from the original on November 3, 2013. Retrieved April 4, 2014. ^ a b c d "Norv Turner, A.J. Smith fired". ESPN. Associated Press. January 1, 2013. Archived from the original on December 6, 2013. Retrieved April 4, 2014. ^ a b "Chargers hire Mike McCoy". ESPN. January 16, 2013. Archived from the original on October 5, 2013. Retrieved April 4, 2014. ^ a b Hogan, Nakia (October 22, 2012). "New Orleans Saints interim coach Joe Vitt returns to take over coaching duties". The Times-Picayune. Archived from the original on April 4, 2014. Retrieved April 4, 2014. ^ a b Garafolo, Mike (January 22, 2013). "NFL Commissioner Roger Goodell reinstates Saints coach Sean Payton". USA Today. Archived from the original on April 4, 2014. Retrieved January 22, 2013. ^ a b Klis, Mike (November 5, 2013). "Broncos name Jack Del Rio interim head coach while John Fox recovers". The Denver Post. Archived from the original on November 6, 2013. Retrieved April 7, 2014. ^ a b Klis, Mike (November 2, 2013). "Broncos coach John Fox to undergo aortic valve replacement surgery". The Denver Post. Archived from the original on April 7, 2014. Retrieved April 7, 2014. ^ Klis, Mike (December 8, 2013). "John Fox started day of first game back with Bob Marley, Chevy Chase". The Denver Post. Archived from the original on April 7, 2014. Retrieved April 7, 2014. ^ a b Sessler, Marc (December 6, 2013). "Gary Kubiak fired as Houston Texans head coach". Around the League (blog). NFL.com. Archived from the original on December 12, 2013. Retrieved January 19, 2014. ^ a b Patra, Kevin (November 6, 2013). "Wade Phillips picked as Houston Texans' interim coach". Around the League (blog). NFL.com. Archived from the original on November 11, 2013. Retrieved April 4, 2014. ^ Smith, Brian T. (November 5, 2013). "Kubiak leaves hospital, won't coach Texans game Sunday". Houston Chronicle. Ultimate Texans (blog). Archived from the original on November 11, 2013. Retrieved April 7, 2014. ^ Rieken, Kristie (November 24, 2013). "Jaguars send Texans to 9th straight loss, 13-6". Houston Chronicle. Associated Press. Archived from the original on April 7, 2014. Retrieved April 7, 2014. ^ a b "Cards promote Steve Keim to GM". ESPN. Associated Press. January 8, 2013. Archived from the original on January 12, 2013. Retrieved April 3, 2014. ^ "Cards fire Ken Whisenhunt, Graves". ESPN. Associated Press. January 8, 2013. Archived from the original on January 27, 2014. Retrieved April 9, 2014. ^ "Cardinals fire GM, two assistants". Sports Illustrated. Associated Press. January 6, 2003. Archived from the original on September 21, 2013. Retrieved April 9, 2014. ^ "Rod Graves bio". Pro-Football-Reference.com. Archived from the original on April 9, 2014. Retrieved April 9, 2014. ^ a b Gaughan, Mark (May 13, 2013). "Nix says time right to step down". The Buffalo News. Archived from the original on April 4, 2014. Retrieved April 4, 2014. ^ a b Gaughan, Mark (May 16, 2013). "Bills promote Whaley to take over as GM". The Buffalo News. Archived from the original on April 4, 2014. Retrieved April 4, 2014. ^ a b c d Gaughan, Mark (January 1, 2013). "Brandon takes reins for 'new era'". The Buffalo News. Archived from the original on November 10, 2013. Retrieved April 4, 2014. ^ a b Cabot, Mary Kay (January 18, 2013). "Former Cleveland Browns personnel executive Mike Lombardi hired as Browns Vice President of Player Personnel". The Plain Dealer. Archived from the original on March 14, 2013. Retrieved April 4, 2014. ^ "Tom Heckert bio". Pro-Football-Reference.com. Archived from the original on April 9, 2014. Retrieved April 9, 2014. ^ a b Brinson, Will (December 31, 2012). "Jaguars fire GM Gene Smith". Eye on Football (blog). CBS Sports. Archived from the original on December 31, 2013. Retrieved April 4, 2014. ^ a b O'Halloran, Ryan (January 8, 2013). "Jaguars hire David Caldwell as GM". Jacksonville.com. The Florida Times-Union. Archived from the original on January 10, 2013. Retrieved April 4, 2014. ^ "Jaguars fire GM Gene Smith". ESPN. Associated Press. December 31, 2012. Archived from the original on July 29, 2013. Retrieved April 4, 2014. ^ a b Garafolo, Mike (January 4, 2013). "GM Scott Pioli fired by Chiefs". USA Today. Archived from the original on April 4, 2014. Retrieved January 17, 2013. ^ a b "Chiefs introduce GM John Dorsey". ESPN. Associated Press. January 14, 2014. Archived from the original on March 27, 2013. Retrieved April 4, 2014. ^ "Scott Pioli bio". Pro-Football-Reference.com. Archived from the original on April 9, 2014. Retrieved April 9, 2014. ^ Hendricks, Martin (September 17, 2009). "Green Bay suits Dorsey just fine". Milwaukee Journal Sentinel. Archived from the original on January 19, 2013. Retrieved April 9, 2014. ^ a b Shpigel, Ben (December 31, 2012). "Ryan Stays; Tannenbaum Goes; Other Answers Are Scarce". The New York Times. Archived from the original on January 3, 2013. Retrieved April 8, 2014. ^ a b Shpigel, Ben (January 19, 2013). "Jets Name Leaders in Front Office and Offense". The New York Times. Archived from the original on January 25, 2013. Retrieved April 8, 2014. ^ a b Gehlken, Michael (January 9, 2013). "Chargers choose Tom Telesco for GM". U-T San Diego. Archived from the original on March 13, 2013. Retrieved April 9, 2014. ^ Hanzus, Dan (January 1, 2013). "A.J. Smith: San Diego Chargers were right to fire me". Around the League (blog). NFL.com. Archived from the original on March 6, 2014. Retrieved April 9, 2014. ^ "A.J. Smith bio". Pro-Football-Reference.com. Archived from the original on April 9, 2014. Retrieved April 9, 2014. ^ a b c d e f g h i "Awards Announced at "3rd Annual NFL Honors" Super Bowl Eve on FOX" (PDF). February 1, 2014. National Football League. Archived (PDF) from the original on February 16, 2014. Retrieved April 4, 2014. ^ Covitz, Randy (January 16, 2014). "Pro Football Writers select Chiefs' John Dorsey as NFL executive of the year". The Kansas City Star. Archived from the original on April 15, 2014. Retrieved April 15, 2014. ^ Condotta, Bob; Jenks, Jayson (February 2, 2014). "Seahawks' Malcolm Smith makes big plays, wins MVP award". Seahawks Notebook (blog). The Seattle Times. Archived from the original on March 5, 2014. Retrieved April 7, 2014. ^ "2013 All-Pro Team". Associated Press. January 3, 2014. Archived from the original on January 4, 2014. Retrieved April 7, 2014. ^ a b c "Broncos QB Peyton Manning, Chiefs LB Justin Houston & Jets K Nick Folk Named AFC Players of Week 1" (PDF). NFL. September 11, 2013. Archived (PDF) from the original on September 27, 2013. Retrieved September 27, 2013. ^ a b c "49ers WR Anquan Boldin, Rams DE Robert Quinn & WR-PR Dwayne Harris Named NFC Players of Week 1" (PDF). NFL. September 11, 2013. Archived (PDF) from the original on September 27, 2013. Retrieved September 27, 2013. ^ a b c "Chargers QB Philip Rivers, Bills DE Mario Williams & Broncos PR/WR Trindon Holliday Named AFC Players of Week 2" (PDF). NFL. September 18, 2013. Archived (PDF) from the original on September 27, 2013. Retrieved September 27, 2013. ^ a b c "Packers QB Aaron Rodgers, Seahawks CB Richard Sherman & Bears KR-PR Devin Hester Named NFC Players of Week 2" (PDF). NFL. September 18, 2013. Archived (PDF) from the original on September 27, 2013. Retrieved September 27, 2013. ^ a b c "Broncos QB Peyton Manning, Chiefs LB Justin Houston & Cleveland P Spencer Lanning Named AFC Players of Week 3" (PDF). NFL. September 25, 2013. Archived (PDF) from the original on September 27, 2013. Retrieved September 27, 2013. ^ a b c "Saint TE Jimmy Graham, Panthers DE Greg Hardy and Lions P Sam Martin named NFC Players of Week 3" (PDF). NFL. September 25, 2013. Archived (PDF) from the original on September 27, 2013. Retrieved September 27, 2013. ^ a b c "Chargers QB Philip Rivers, Titans CB Alterraun Verner & Chiefs PR Dexter McCluster Named AFC Players of Week 4" (PDF). NFL. October 2, 2013. Archived (PDF) from the original on October 4, 2013. Retrieved October 2, 2013. ^ a b c "Saint QB Drew Brees, Cardinals CB Patrick Peterson and Seahawks K Steven Hauschka named NFC Players of Week 4" (PDF). NFL. October 2, 2013. Archived (PDF) from the original on October 4, 2013. Retrieved October 2, 2013. ^ a b c "Broncos QB Peyton Manning, Chiefs LB Justin Houston & Broncos KR Trindon Holliday Named AFC Players of Month for September" (PDF). NFL. October 3, 2013. Archived (PDF) from the original on October 4, 2013. Retrieved October 3, 2013. ^ a b c "Saints TE Jimmy Graham, Seahawks CB Richard Sherman & Vikings KR Cordarrelle Patterson NFC Players of Month for September" (PDF). NFL. October 3, 2013. Archived (PDF) from the original on October 4, 2013. Retrieved October 3, 2013. ^ a b c "Jets QB Geno Smith, Raiders S Charles Woodson & Browns PR Travis Benjamin named AFC Players of Week 5" (PDF). NFL. October 9, 2013. Archived (PDF) from the original on October 9, 2013. Retrieved October 9, 2013. ^ a b c "Eagles WR De Sean Jackson, 49ers CD Tramaine Brock & Packers K Mason Crosby named NFC Players of Week 5" (PDF). NFL. October 9, 2013. Archived (PDF) from the original on October 9, 2013. Retrieved October 9, 2013. ^ a b c "Bengals QB Andy Dalton, Chiefs LB Tamba Hali & Charger K Nick Novak named AFC Players of Week 6" (PDF). NFL. October 16, 2013. Archived (PDF) from the original on October 16, 2013. Retrieved October 16, 2013. ^ a b c "Eagles QB Nick Foles, Panthers LB Thomas Davis & Cowboys KR-PR Dwayne Harris named NFC Players of Week 6" (PDF). NFL. October 16, 2013. Archived (PDF) from the original on October 16, 2013. Retrieved October 16, 2013. ^ a b c "Colts QB Andrew Luck, Bills DE Mario Williams & Steelers K Shaun Suisham named AFC Players of Week 7" (PDF). NFL. October 23, 2013. Archived (PDF) from the original on October 23, 2013. Retrieved October 23, 2013. ^ a b c "Falcons QB Matt Ryan, Cowboys LB Sean Lee & 49ers P Andy Lee named NFC Players of Week 7" (PDF). NFL. October 23, 2013. Archived (PDF) from the original on October 23, 2013. Retrieved October 23, 2013. ^ a b c "Bengals WR Marvin Jones, Broncos CB Dominique Rodgers-Cromartie & Chiefs K Ryan Succop named AFC Players of Week 8" (PDF). NFL. October 30, 2013. Archived (PDF) from the original on November 1, 2013. Retrieved November 1, 2013. ^ a b c "Lions WR Calvin Johnson, Giants CB Terrell Thomas & Vikings KR Cordarrelle Patterson named NFC Players of Week 8" (PDF). NFL. October 30, 2013. Archived (PDF) from the original on November 1, 2013. Retrieved November 1, 2013. ^ a b c "Bengals QB Andy Dalton, Colts LB Robert Mathis & Patriots K Stephen Gostkowski named AFC Players of Month for October" (PDF). NFL. October 31, 2013. Archived (PDF) from the original on November 1, 2013. Retrieved November 1, 2013. ^ a b c "Lions WR Calvin Johnson, Cowboys LB Sean Lee & Packers K Mason Crosby named NFC Players of Month for October" (PDF). NFL. October 31, 2013. Archived (PDF) from the original on November 1, 2013. Retrieved November 1, 2013. ^ a b c "Browns QB Jason Campbell, Dolphins DE Cameron Wake & Jets K Nick Folk named AFC Players of Week 9" (PDF). NFL. November 6, 2013. Archived (PDF) from the original on November 6, 2013. Retrieved November 6, 2013. ^ a b c "Eagles QB Nick Foles, Bears DE Shea McClellin & Seahawks PR Golden Tate named NFC Players of Week 9" (PDF). NFL. November 6, 2013. Archived (PDF) from the original on November 21, 2013. Retrieved November 6, 2013. ^ a b c d e f Patra, Kevin (November 13, 2013). "Tavon Austin, Drew Brees among Week 10 winners". Around the League (blog). NFL.com. Archived from the original on November 21, 2013. Retrieved November 13, 2013. ^ a b c "Steelers QB Ben Roethlisberger, Bengals LB Vontaze Burfict & Colt K Adam Vinatieri named AFC Players of Week 11" (PDF). NFL. November 20, 2013. Archived (PDF) from the original on November 21, 2013. Retrieved November 21, 2013. ^ a b c "Buccaneers RB Bobby Rainey, Giants DE Jason Pierre-Paul & Eagles P Donnie Jones named NFC Players of Week 11" (PDF). NFL. November 20, 2013. Archived (PDF) from the original on November 21, 2013. Retrieved November 21, 2013. ^ a b c d e f g h i j k l m Wesseling, Chris (November 27, 2013). "Nick Foles, Big Ben lead NFL players of the month". Around the League (blog). NFL.com. Archived from the original on March 6, 2014. Retrieved November 27, 2013. ^ a b c d e f Patra, Kevin (December 4, 2013). "Russell Wilson, Eric Decker among players of the week". Around the League (blog). NFL.com. Archived from the original on December 9, 2013. Retrieved December 4, 2013. ^ a b c d e f Patra, Kevin (December 11, 2013). "Josh McCown, John Abraham lead players of the week". Around the League (blog). NFL.com. Archived from the original on December 14, 2013. Retrieved December 11, 2013. ^ a b c d e f Patra, Kevin (December 18, 2013). "Michael Thomas, Sherman lead NFL players of the week". Around the League (blog). NFL.com. Archived from the original on January 27, 2014. Retrieved December 18, 2013. ^ a b c d e f Hanzus, Dan (December 24, 2013). "Peyton Manning, Luke Kuechly earn Week 16 awards". Around the League (blog). NFL.com. Archived from the original on March 6, 2014. Retrieved December 24, 2013. ^ a b c "Week 17 AFC Players of the Week" (PDF). NFL. December 31, 2013. Archived (PDF) from the original on January 2, 2014. Retrieved December 31, 2013. ^ a b c "Week 17 NFC Players of the Week" (PDF). NFL. December 31, 2013. Archived (PDF) from the original on January 2, 2014. Retrieved December 31, 2013. ^ a b c "AFC December Players of the Month" (PDF). NFL. January 2, 2014. Archived (PDF) from the original on January 4, 2014. Retrieved January 2, 2014. ^ a b c "NFC December Players of the Month" (PDF). NFL. January 2, 2014. Archived (PDF) from the original on January 4, 2014. Retrieved January 2, 2014. ^ a b "FedEx Air and Ground Players of the Week". NFL.com. Archived from the original on January 4, 2014. Retrieved April 7, 2014. ^ "Pepsi Next Rookie of the Week". NFL.com. Archived from the original on February 12, 2014. Retrieved September 20, 2013. ^ "Texans WR DeAndre Hopkins & Bills LB Kiko Alonso Named NFL Rookies of Month for September" (PDF). NFL. October 3, 2013. Archived (PDF) from the original on October 4, 2013. Retrieved October 3, 2013. ^ "Packers RB Eddie Lacy & Cardinals S Tyrann Mathieu Named NFL Rookies of Month for October" (PDF). NFL. October 31, 2013. Archived (PDF) from the original on November 1, 2013. Retrieved November 1, 2013. ^ "NFL Rookies of Month for December" (PDF). NFL. January 2, 2014. Archived (PDF) from the original on January 4, 2014. Retrieved January 2, 2014. ^ "2013 NFL Opposition & Defensive Statistics". Pro-Football-Reference.com. Archived from the original on March 26, 2014. Retrieved April 10, 2014. ^ "NFL Attendance – 2013". ESPN. Archived from the original on April 14, 2014. Retrieved April 14, 2014. ^ Zulgad, Judd (January 2, 2013). "Ground will be broken on Vikings' new stadium during the 2013 season". 1500ESPN.com. Archived from the original on March 25, 2014. Retrieved February 1, 2013. ^ "What to Look For — A Look Back (Week 5)" (PDF). National Football League. December 23, 2013. Archived (PDF) from the original on December 24, 2013. Retrieved April 1, 2014. ^ Price, Taylor (April 19, 2012). "49ers Break Ground on Santa Clara Stadium". 49ers.com. Archived from the original on March 25, 2014. Retrieved December 12, 2012. ^ Booth, Randy (February 23, 2013). "Candlestick Park, home of 49ers, scheduled for demolition after 2013 season". SB Nation. Archived from the original on March 25, 2014. Retrieved February 23, 2013. ^ Funk, John (January 17, 2013). "Cleveland Browns' stadium deal with FirstEnergy averages about $6 million a year for 17 years". The Plain Dealer. Retrieved January 17, 2013. ^ "Cowboys Stadium to be renamed AT&T Stadium". USA Today. Associated Press. July 25, 2013. Retrieved July 25, 2013. ^ Strauss, Chris (February 5, 2013). "Jacksonville Jaguars decide to make logo even tamer". USA Today. Game On! (blog). Archived from the original on April 3, 2014. Retrieved April 3, 2014. ^ "Jacksonville Jaguars and Nike unveil new uniform design for 2013". Press release. Nike, Inc. April 23, 2013. Archived from the original on October 7, 2013. Retrieved April 3, 2014. ^ Lukas, Paul (April 23, 2013). "Uni Watch analysis: New Jaguars uniforms". Uni Watch (blog). ESPN. Archived from the original on February 13, 2014. Retrieved April 3, 2014. ^ "SEE IT: Jacksonville Jaguars unveil new Nike uniforms". Daily News (New York). Associated Press. April 24, 2013. Archived from the original on December 10, 2013. Retrieved April 3, 2014. ^ "Miami Dolphins 2013 Nike Elite 51 uniform". Press Release. Nike, Inc. April 25, 2013. Archived from the original on October 6, 2013. Retrieved April 3, 2014. ^ Davis, Craig (April 24, 2013). "Dolphins' new look goes back to the future". Sun-Sentinel. Archived from the original on May 29, 2013. Retrieved April 3, 2014. ^ a b Lukas, Paul (April 25, 2013). "Assessing the Vikings', Dolphins' new unis". Uni Watch (blog). ESPN. Archived from the original on October 23, 2013. Retrieved April 3, 2014. ^ Sessler, Marc (February 14, 2013). "Minnesota Vikings give Norseman logo facelift for 2013". Around the League (blog). NFL.com. Archived from the original on March 6, 2014. Retrieved February 14, 2013. ^ "Minnesota Vikings and Nike unveil new uniform design for 2013 season". Press release. Nike, Inc. April 23, 2013. Archived from the original on October 5, 2013. Retrieved April 3, 2014. ^ Henne, Ricky (June 2, 2013). "Chargers Tweak Jerseys for First Time Since 2007". Chargers.com. San Diego Chargers. Archived from the original on December 7, 2013. Retrieved June 26, 2013. ^ Sessler, Marc (June 26, 2013). "San Diego Chargers announce alterations to uniforms". Around the League (blog). NFL.com. Archived from the original on March 6, 2014. Retrieved April 3, 2014. ^ Salomone, Dan (May 31, 2013). "Giants Unveil New Alternate White Pants". Giants.com. New York Giants. Archived from the original on July 16, 2013. Retrieved April 3, 2014. ^ Salomone, Dan (August 28, 2013). "Giants announce dates for alternate pants". Giants.com. New York Giants. Archived from the original on April 3, 2014. Retrieved April 3, 2014. ^ Wyatt, Jim (July 27, 2013). "Titans to bring back navy blue". Titans Insider (blog). The Tennessean. Archived from the original on November 10, 2013. Retrieved July 27, 2013. ^ Reiss, Mike (November 10, 2013). "Quick-hit thoughts around NFL & Patriots". ESPNBoston.com. ESPN. Archived from the original on November 11, 2013. Retrieved April 3, 2014. ^ Chase, Chris (November 3, 2013). "New NFL rule ruins Redskins' iconic throwback uniforms". USA Today. For the Win! (blog). Archived from the original on January 15, 2014. Retrieved April 3, 2014. ^ Florio, Mike (September 18, 2013). "Vikings, Packers will wear throwbacks with their standard helmets". Profootballtalk.com. Archived from the original on September 21, 2013. Retrieved April 3, 2014. ^ Chase, Chris (November 28, 2013). "Cowboys will wear blue jerseys at home for first time in decades". USA Today. For the Win! (blog). Archived from the original on December 3, 2013. Retrieved November 28, 2013.
Zimmer, Jon; Lee, Branden; Mariani, Matt (2014). Official 2014 National Football League Record & Fact Book (PDF). Archived from the original (PDF) on February 4, 2015.